Apple just released its latest iOS 6.1.3 update, which fixes a lock screen security flaw that allows users to bypass a passcode lock. 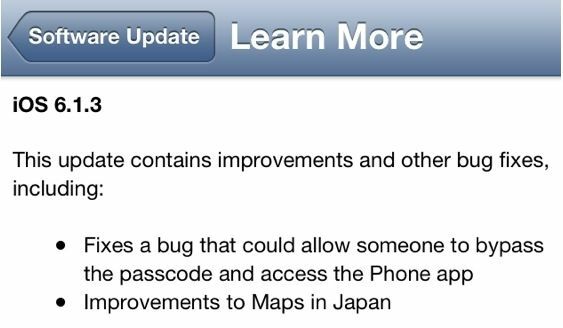 The update also makes improvements to Maps for users in Japan. The update is being made available over-the-air via Software Update, but you can also download and install it via iTunes on your Mac or PC. The update weighs in at just 18.2MB. Apple already addressed a number of issues with its Maps app in Japan with an update that was released earlier this month. It’s unclear at this point what further improvements the latest iOS 6.1.3 update will make. If you have a jailbroken iOS device, then you’ll want to avoid this update for the time being. It’s not clear whether the evasi0n jailbreak is compatible with this release, or whether Apple has patched the exploit that it uses to gain root access to your device. UPDATE: It appears Apple has patched the exploits that were used by evasi0n, so iOS 6.1.3 kills the jailbreak. Don’t update if you want to keep your jailbreak.